Does That Burning Smell Mean You Need Furnace Repair? You are here: Home / HVAC Info & Articles / Articles / Does That Burning Smell Mean You Need Furnace Repair? When you switch the thermostat setting from Cool to Heat and turn the furnace on for the first time, an odd burning smell fills your house. What could it be? We’ll help you figure out what caused this burning odor. But first, you need to stay calm and switch the thermostat setting to “off”. You will need to go over to your heating system and confirm that you do not see a fire or other serious situation at that location. There are a number of circumstances that can cause this smell to occur. Even if your heating system passes this basic type of DYI inspection, you need to schedule a seasonal furnace inspection and maintenance appointment with Berico Fuels. 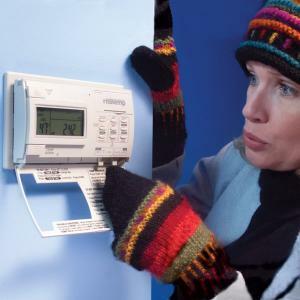 Serious issues and potential system failures can be avoided when furnace service and repairs in the Greensboro area are made at the start of the cold season. While your furnace sat in an idle mode during the spring and summer seasons, dust accumulated inside of the combustion chamber. After turning on the furnace, the chamber was ignited, searing debris which caused the burning odor. Next, a blower pushed the warm air through all of your ducts, sending the burnt smelling air around your home. The good news is that this type of burning smell produced from dust is safe. The odor will leave your home quickly, with the help of opening one or a few windows to let it escape. If you continue to notice a burning smell, this indicates that there could be another problem with your furnace. Call Berico Fuels to provide a tune-up and inspection of your heating system, as well as the recommended maintenance to keep your system working properly. Replacing your furnace filters on a regular basis will make the air cleaner in your home. If it has been months since you last changed your furnace filter, this a possible reason for the burning smell. When using a forced-air furnace, a clean filter is essential to delivering warm, healthy air to the rooms in your home. The filters take out allergens and airborne particles, such as mold spores, pollen, dust and pet dander. Filters work to clean the air before your furnace is heated, so that the circulated air is free of allergy-producing particles. When the filter becomes dirty or extremely soiled, the filter cannot work as intended because the filter fibers will be clogged with dirt and dust. This can cause a bad smell. Pay attention to your filters to prevent a dangerous fire, which may develop from an overheated unit. The good news with this is that it is easy to fix the bad odor if a dirty filter is the cause. Simply change the filter with a new, clean one and the burning smell will disappear. It is important to keep track of filter changes, and make sure they occur every 30-60 days or as recommended by the manufacturer. Extend the life of your heating system and prevent malfunctions by frequently changing furnace filters. If this does not resolve the burning odor, contact Berico Fuels for furnace service in Greensboro and surrounding areas. The blower functions by drawing heat from your furnace and pushing it throughout your home. The unit’s internal temperature is also managed by the blower, so it will not get too hot. Mechanical devices sometimes need a repair, so that is also true of the furnace blower. When a blower stops working effectively, overheating of the furnace can occur, producing the burning odor throughout your house. If this happens, contact Berico Fuels immediately. It is important to call a certified technician for this type of repair, and our qualified technicians are fully trained to provide excellent repairs and maintenance for your heating system. If all three of the potential causes listed above have been checked and the burning smell is still present, contact Berico Fuels right away to schedule an inspection of your heating system. We will get rid of the smell and keep your home safe and comfortable. Our trained technicians will help you identify the problem and will perform repairs to fix the bad odor. At Berico Fuels, we offer quality maintenance, installation and repair services in the Greensboro area for commercial and residential customers. Call us at 336-496-2509 to schedule your furnace and heating checkup and service. https://www.berico.com/wp-content/uploads/2018/12/header-logo-new-3a.png 0 0 berico_admin https://www.berico.com/wp-content/uploads/2018/12/header-logo-new-3a.png berico_admin2014-11-25 06:54:352017-11-01 17:53:50Does That Burning Smell Mean You Need Furnace Repair?